All right, after my few weeks of complaining about the direction of the season, we finally moved back toward what made the first season great. Again, not that I thought season was any massive step down — just a different direction. But this week’s episode brought us back to the nuances that made the first season so terrifying and great. I love any episode that focuses on Serena. Her expansion from the evil stepmother type in the book into a complicated and, frankly, tragic figure (for more on that check out my interview with Yvonne Strahovski from last fall) is one of the best choices the show made in its adaptation of the work. We’re reminded this week that Serena is very much a woman who abused her privileged position to hand over her own freedom — and the freedom of every woman in America. June is undergoing an ultrasound and they determine the child is completely healthy, despite her scare. Serena allows June to see the ultrasound monitor to look at her child. When they get home, Serena sets her up in the living room as to not exert her on the stairs. June is cold to Nick’s new wife and June insists that they can no longer have secret rendezvous. That night, June gets up to get water where she has a tense, brief, conversation with Commander Waterford in the kitchen before returning. 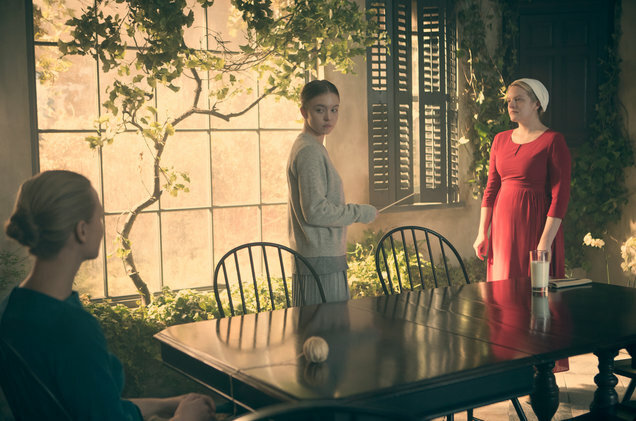 In the morning, Serena organizes a brunch for June and the other Handmaids to allow them social time. Serena shows June the nursery and June asks for a chance to see her daughter. Serena denies her and their budding bond turns cold quickly. While June is packing her things to return to her room, Eden expresses her doubts about Nick, who has rebuffed her advances. She believes he might be a gender traitor and, fearing she may turn Nick in, June convinces him to warm up to his wife. Serena shares her frustrations over June with Fred who, as a peace offering, gives June a picture of her daughter. He then attempts to rekindle their relationship but she makes up an excuse to decline. Two days later, during the opening of Fred’s pet project — the Rachel and Leah Center to train new Handmaids — Ofglen detonates a bomb. In flashbacks, Serena and Fred are speaking at a local college where they receive an angry response from students that quickly turns violent. Serena is eventually able to get the crowd’s attention and insists on the need to focus on the dwindling birth rates, to some positive response. However, as they are leaving the event, she is shot. Fred tracks down the student who shot her and shoots the student's wife in front of him as revenge. My big takeaway this week was how the show continues to paint a tragic portrait of women turned against each other. Throughout this episode I fell for the false peace and borderline friendship between June and Serena that was, unsurprisingly, ultimately dismantled when the facade fell away. It did, however, for the first time feel like Serena was offering her kindness for more than just the sake of her baby. There’s a connection between June and Serena of shared slavery and pain. But Serena’s resentment of June’s ability to have a child and her resentment of herself for the harm she’s caused a mother create difficult roadblocks to overcome. Their animosity gets to remain between them, with little interference from Fred or Nick. Their hatred just as much as a would-be friendship, is a woman’s issue — between women. Speaking of which: I didn’t realize how frustrating I found Nick until this week. He often cryptically offers advice to June and claims he knows best for her, but this week his latent mansplaining got turned around when he revealed his reluctance to consummate his relationship with his new wife... which June points out is hypocritical, considering her own sexual slavery. He claims it’s “unfair” and June brushes him off and walks out of the room. While the situation is an extreme one, it is still an example of the different rules that are assigned for men and women in social situations: women are expected to do or be something, while men have the luxury of choice and don’t acknowledge this privilege. Ultimately, this week was a set-up for me from the bonkers, rushed plot of the first few episodes (that ended up nowhere). And, of course, this show continues to be unsettling and almost hard to watch at times with how close it hits to our unfortunately current home.